This week is one many of you probably are closing up shop not just for a few days but most likely till the new year. You are focusing on spending time with friends, loved ones, and family. You are baking, rushing from one event to another, hopping on a plane, wrapping, decorating, and trying to accomplish that DIY you saw on Pinterest last year you swore you would make this year. There is a hustle and a bustle to the life of the holiday season. There is no doubt about that. There can also be a lot of joy, sadness, anxiousness, and loneliness. It is a season of a lot of emotions, and before we know it, we blink, and it all has come and gone and another year has begun. The wildness of the season and fluctuation of emotions always leaves me feeling some sort of regret whether it be someone I forgot to call and wish a happy holiday, the holiday cards that never went out, or the fact my decor just wasn’t as cute as I wish it could have been. Whatever it is something trite or serious, one thing holds true: It all goes quickly. This year has forced me into a slower pace of life both because of my physical body and because we are doing the holiday at home. We don’t have guests coming in, and we are not guests ourselves. This year, we can linger together watching the tree, talking, and soaking in the holiday. Sure it will be different, we will miss our families a lot, but I know it will be beautiful and perfect in its own way even if the Christmas cards never made it out and I ruined a batch of gingerbread cookies. There is a lot to be thankful for this year such as a very active and hiccuping baby, a warm home, a great year of work, a happy and loving marriage, health, wonderful family, and good friends. Those things are greater gifts than anything someone could place for me under a tree this year. 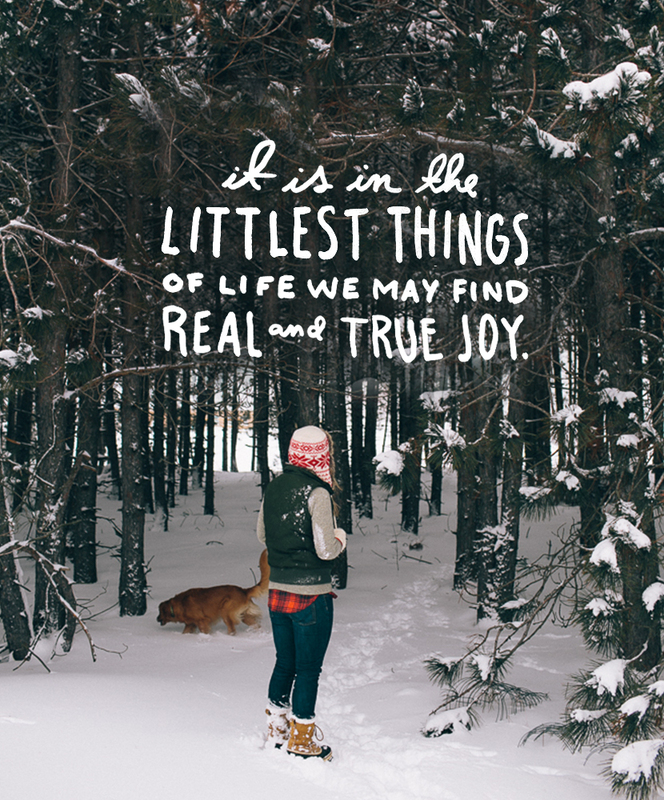 What this time of year has taught me over the years is that because of the pace of the season, we must find ways to slow down, let go of what won’t be done, stop comparing, and instead enjoy the simplest and smallest things. Whether the joy of feeling the kicks of a baby nearing its time for entering the world, the glow of a Christmas tree late in the evening, the hope for a dream coming true, a glass of wine enjoyed with someone you love in the stillness of a winter night, the giving of a handmade gift, and the list goes on. These small things aren’t about what you place under the tree, the holiday parties you HAD to go to, or anything other than simply remembering to enjoy this season in all of its tiniest and simplest ways it should be enjoyed. These are the moments that sometimes are overlooked because of the obligations the season can present. We sometimes forget these are the moments our energy and focus should be placed over the pace and expectation of what the holidays bring. The greatest gift we can give ourselves and those around us this time of year is taking the time to enjoy one of these small moments that most likely didn’t cost anything showed up without expectation and are meant simply to be felt and enjoyed simply for what they are. This is a time of year we have the option to allow in those simple and pure moments of life all we have to do is look for them and then allow ourselves to soak them up. So, I hope as you enter this week of the holiday season. However you spend it and celebrate, I hope you find a moment to enjoy and intentionally soak in the season for all it is worth. They say when you find time to enjoy a moment and not focus on the perfect or imperfect nature it brings joy no matter what. I wish you all the greatest joy this season. A new year isn’t too far away. I hope this second to last week of the year leaves you with a great big smile on your face! You’ve has such an exciting year, Megan! I can’t wait to see what’s in store for you in 2016 — and to “virtually” meet your little one. ThIs time of year goes by so fast. It’s important to enjoy each and every moment of the season. This time of year is such a struggle between doing what you think needs to be done and just enjoying the moment. I feel like i have already checked most items off my holiday to do list. I am personally struggling between getting work done versus Embracing needed down time with loved ones. Thanks for this, I needed to read it. I really enjoyed this post Megan! It’s so true how life goes by so quickly and it’s so vital that we learn the power of slowing down and living in the moment. Thank you for sharing and Happy holidays to you and your family!! Lovely post! The photos are amazing! I love this beautiful holiday post so much!